Home » World » South Asia » Yuvraj Singh has Lung tumor!!! Yuvraj Singh has Lung tumor!!! Yuvraj Singh is battling out a tumor in his left lung! Indian Cricketer and the World Cup 2011 star performer, Yuvraj singh has been missing cricket matches for India some month now. His recent drop from the Indian squad touring Australia was a definite shocker for all the Indian fans. However, the real reason behind Yuvraj’s disappearance from the field since the World Cup 2011 has been made clear by his mother. Yuvraj’s mother Shabnam said in a statement, “Reports and scans then showed us that Yuvraj was dealing with something really serious. A golf-ball size lump was found over his left lung and doctors advised us to go in for more detailed scans. The initial reports suggested that Yuvraj had what in medical terms, is called a abnormal tumour called lymphoma over his left lung. The danger was, we were told, that it could be malignant. “When he returned from England… detailed scanning, and biopsy reports indicated that the tumour is non-malignant and non-threatening and can be treated through proper medication and therapy. In medical terms, Yuvraj is now in a much better state and on his way to a full recovery” , she added. Shabnam further said Yuvraj did not want to rush his return to the side and that’s why he informed BCCI about his unavailablity for the West Indies series. “Now his entire focus is to re-gain his full fitness. He is already preparing himself to play the One Day series in Australia.He doesn’t want to rush things, he wants to be hundred percent fit before resuming his cricket for India”. Che, this is sad. Lets hope that Yuvraj makes a speedy recovery and return back with good health. End Of Career for Nick Folk? 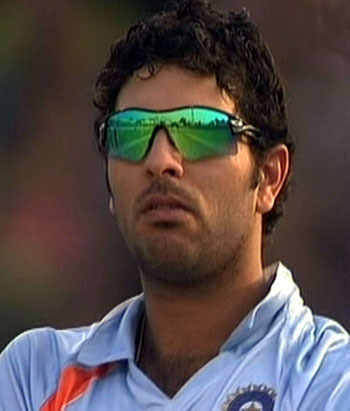 yuvi u r fighter, hope u will be fine sooner all my wishes with family and god blessing u will be alright .